Home » Why Indoor Oceans? Indoor Oceans® is a professional aquarium design, installation, and maintenance company that specializes in large saltwater and reef aquarium systems. Founded in East Tennessee in 1993, Indoor Oceans provides custom design and installation servicesnationwide and offers maintenance services in Tennessee, and central Florida. Indoor Oceans provides high quality marine live stock (fish, invertebrates, corals, etc.) and live rockfrom around the world and offers a large selection of supplies, aquariums and custom cabinet options. With low overhead, Indoor Oceans is able to offer products at lower prices than most retail outlets. Having developed relationships with well over 40 distributors and manufacturers located as far away as Hawaii and Fiji, we are continually adding new distributors and searching for better quality at better prices. Having such a large number of distributors ensures that you will receive the highest quality product at an affordable price. 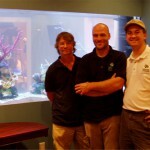 Indoor Oceans offers standard size aquarium systems up to 870 gallons, but we don’t stop there. For those wanting larger systems, Indoor Oceans can also provide planning and installation for aquarium systems as large as the imagination and budget will allow. We also offer custom-built furniture quality cabinets (using Cherry, Mahogany or Oak) finished to our customer’s specifications. Indoor Oceans® handles the complete and proper planning and installation of your system so you can begin enjoying it immediately. We can also provide comprehensive maintenance for your aquarium system if you are in our maintenance service areas. 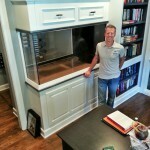 Steve Temple, Indoor Oceans Knoxville Area Owner, stands beside a custom, in-progress saltwater tank project.